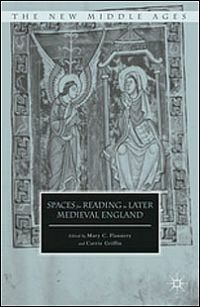 With their collection of essays, Spaces for Reading in Later Medieval England, Mary Flannery and Carrie Griffin set out to contribute to scholarly debates on the history of reading by focusing on the 'relationship between where reading took place and how it took place' (1). By taking the so-called 'spatial turn' that has entered the academic debate in recent years, they aim to shed new light on different reading practices, and on the attitudes and responses people in late medieval England may have had towards reading. The volume brings together ten essays in four sections that offer a broad perspective on space and reading, and especially on the many ways these two concepts could relate to and influence one another. After the short, pragmatic introduction, which in my view should have been more strongly embedded into recent scholarly debates on space, the volume opens with Daniel Wakelin's essay '"Thys ys my boke": Imagining the Owner in the Book'. Wakelin focuses on late 14th- to early 16th-century notes of ownership, not interpreting them in the traditional way as a means of providing information about the provenance of books or the prosopography of people, but by looking at the functions or imaginative effects they might have had for the manuscript users who noted them down, or for later readers who saw them. Not only do these inscriptions mark the owner as a bookish, literate person, they also show the mobility and fragility of book ownership. Particularly interesting is the idea that declarations of possession put book owners in a larger community of readers and as such display the temporal and spatial networks surrounding books. Following A. S. G. Edward's detailed essay on the transmission and circulation of John Walton's Middle English verse translation of Boethius's De consolatione philosophiae, Julia Boffey offers us a very relevant approach to gaining insight into reading culture at a specific moment and in a specific place. After formulating a number of methodological challenges and caveats involved in this type of research - periodization, the historical distance to and patchiness of the sources, and the mixture of technologies for book production at the end of the fifteenth century - she very thoughtfully pieces together a fascinating portrayal of London's book culture in 1501. She uses a large range of very diverse sources (personal letters, legal disputes, chancery records, chronicles), as well as the material remains of printed books produced in the city and imported into London from elsewhere. But, as Boffey rightfully states, the link between book production and reading culture is not necessarily a direct one and annotations that point towards any kind of readership in 1501 are sparse. All the more fascinating are the examples of book consumption Boffey points to, which colour and nuance the information offered by more large-scale, statistical approaches of medieval readership. Stephanie Downes considers three aspects of the concept of space, namely the geographical mobility of books; the spaces within the material text, especially the margins; and the temporal space that users devoted to engaging with books. By focusing on London, Westminster Abbey, MS 21 she investigates how this collection of French poetry which contains, among other writers, works from Guillaume de Machaut and Christine de Pizan, was read and used by amateur readers, that is, readers who did not use the poems as sources for their activities as professional writers (such as Chaucer, Gower, or Lydgate). Interestingly, the book that likely was intended for a female audience but found its way into the hands of military men, diplomats and politicians was used 'as a model for personal epistolary forms' (74) and thus entered the domestic sphere of these men who, by making readers' notes in the book became writers to some extent as well. Although the essay obviously cannot provide an in-depth analysis of all aspects of the readers' traces in the manuscript, Downes convincingly shows how this type of research can bring 'ordinary readers' to the fore. The focus in the next essays shifts to the spaces within the book that shape the process of reading. Tamara Atkin focuses on the title pages of single-play playbooks that were printed before the establishment of commercial playhouses in London in the 1570s and successfully demonstrates - based on five features of those title pages: generic markers; authorial attribution and status; character lists; font; and illustration - that printers aimed as much at what she calls 'playful reading' as on the performing of the texts. Whereas Atkin is mostly able to point to the intended and possible readership of the playbooks - like other contributors to the volume she points to the lack of traces left by readers, which structurally impedes the research into the history of reading. Daniel Sawyer focuses on parchment tabs which do point to the actual use of books by historical readers. Although I am not convinced that 'sets of markers attached to page edges could bring us closer to reading practices than written marginal apparatus can' (103) nor by the suggestion that they were added by the scribes themselves (a statement that he does not return to later in the essay), Sawyer interestingly points out how tabs could help readers quickly to access specific sections of a book, related to, for example, liturgical use, part divisions, or a reader's personal interest, which he demonstrates in a more detailed comparison of thirteen copies of the fourteenth-century poem The Prick of Conscience. 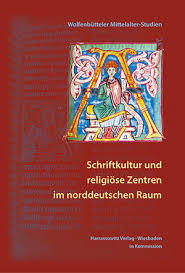 Additionally, he shows the broad range of contexts in which these tabs in late medieval England could appear, from their obvious utility in liturgical books, over notebooks and non-administrative books that circulated in London's mercantile milieu, to literary texts. After Katie L. Walter's essay on the imagined spaces and image-making in the works of Reginald Pecock which links in strongly with prolific research on the medieval ars memoria, the volume switches to its final section on the physical spaces in which reading in later medieval England took place. Based on reading instructions for an urban gentleman, the household devotional regimen of Edward IV's mother Cecily Neville, and The Book of Margery Kempe, Ryan Perry and Lawrence Tuck point to the church and foremost the household, and especially the table, as important locations for devotional reading (both private and communal), and thus make an explicit link to the monastic tradition of table reading. Mary C. Flannery casts new light on May's reading of her lover's letter in the privy in Chaucer's The Merchant's Tale, by framing it as a 'parody of the most iconic medieval representation of a woman reading privately', the Virgin Mary at the Annunciation, who since the 9th and 10th centuries was often depicted with a book in her hands. The volume ends on a high note with Heather Blatt's fascinating essay on 'the readable household' in which she highlights the unique case of a manuscript (London, British Library, MS Royal 18.D.ii) with the sole illuminated copy of John Lydgate's Siege of Thebes, which was acquired by the noble Percy family at the beginning of the 16th century. A copy of the texts that were visible in the family's mansions was added to the manuscript. This offered a great opportunity to shed light on the relationship between reading and architectural space and how these texts could offer a 'contemplative, domestic pilgrimage enacted through embodied reading' (165), thus crossing the boundaries between secular and devotional reading practices and offering their readers a tool to shape themselves while they are walking through the buildings. 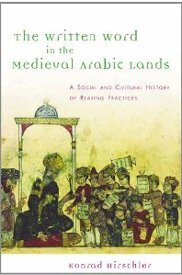 As a book that aims to address the where and how of medieval reading, I find Spaces for Reading in Later Medieval England not entirely convincing. Whereas a number of essays in this volume do indeed focus on the spaces in which books were read and used or on the spaces within books, some others merely offer a traditional approach to the reception of texts. 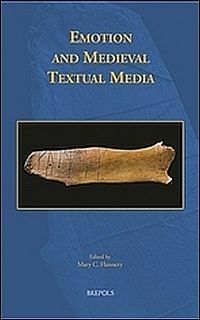 The diversity of methodologies concerning the spatiality of book culture in late medieval England and the lack of theoretical underpinning give the essays in the volume a rather disparate character. Nevertheless, the volume reveals some very interesting new evidence about reading in late medieval England.